"Bob Diven's imaginative recreation of Sargent's world is grounded in contemporary sources and comes across as good theatre". Author of the Sargent Catalogue Raisonne project, and grand-nephew of John Singer Sargent. HISTORY OF THE PLAY: A long-harbored desire to create a theatrical work of my own met with opportunity and inspiration while I was living in Denver, Colorado. THE INSPIRATION: Among my awards for a street-painting festival were tickets to "Sargent in Italy" at the Denver Art Museum. Although the show featured Sargent's watercolors, it included one of his full-length "society" portraits, upon which I spent some attention. Leaving the show I passed through a small auditorium and inspiration struck: I would become John Sargent and present a painting demonstration in character for the museum patrons. I had loved Sargent's work for some time, and owned a beautiful volume of his early portraits from Yale University Press (a series of three volumes which I heartily recommend), but now I began to dig a little more deeply into Sargent as a person. What I found energized me with a growing sense that I "got" Sargent, and felt a growing kinship with him. My original idea for a simple presentation "in character" blossomed into plans for a Broadway-style musical (which may yet come to be). Using the not-insignificant resources of the Denver public library system, I gathered page after page of notes. I also looked at the many new books on Sargent, and ordered copies of a stack of his personal letters from Syracuse University. Although Sargent kept no diary, he was a very expressive man among his friends (whom he wrote often). Therefore many revealing words and phrases of the man were there to be found in addition to his more famous quotes. When I came back to Las Cruces, I was asked if I had anything to submit to a local one-act play festival. The time had come to write the show. I began with the beginning, aiming to have at least the first 15 minutes in some presentable form, planning to use the experience of writing and performing that portion to guide me in completing the show. This proved difficult to do in two ways: the first was my un-tested skill as a playwright; the second the difficulty as an actor and creator to put on stage an unpolished part of an un-finished whole. But with directorial help from a theater colleague, I gave the first draft performance of (what was then called) Unpaintable Beauty. My friend and playwright Mark Medoff was in the audience one night, and assured me that there was "something there" in my idea. I got one or two other comments during the play's run that gave me the clues I needed to proceed to the next step. Mark said to send him the script when I had a full draft and he'd look at it. I did that, and on the front of it scribbled "wanna direct?" It turned out that he did. (Mark had directed me in a Dona Lyric Opera production of The Sound of Music, and I knew that he could draw from me as an actor what I needed to portray John Sargent). What I hadn't counted on was his mentoring me as a playwright in addition to directing me in the play. What followed was one of the most intense two months of work, growth and discovery in my life. The play became a two-character piece for a time, and we worked with a young actress (Melissa Pincomb), but it was a one-man show I had originally envisioned, and as our premiere approached, I made the decision to go on without her character. Mark, to his credit, respected my impulse and adapted his formidable talents to my purpose. 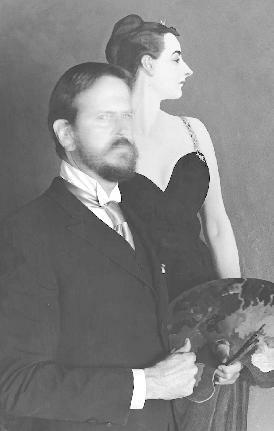 Ceil and Peter Herman at the Black Box Theater agreed to produce the premiere of (what was now called) "John Singer Sargent: Painting Madame X". Mark and I continued to work as writer/actor and director/mentor until the final two weeks before opening, when the script had coalesced into its "final" form, and I became a full-time actor. As an actor, now, I could finally truly begin to enter into Sargent's skin -- having created the setting and the words; I began to physically inhabit the world we were creating. The first performance and talk-back for an invited preview audience told me all I needed to know: I had done what I set out to do, which was to create a piece of drama that felt personally true, that entertained and had an emotional impact. Ahead lay the additional refinement and internalization of the piece that comes with each new performance. 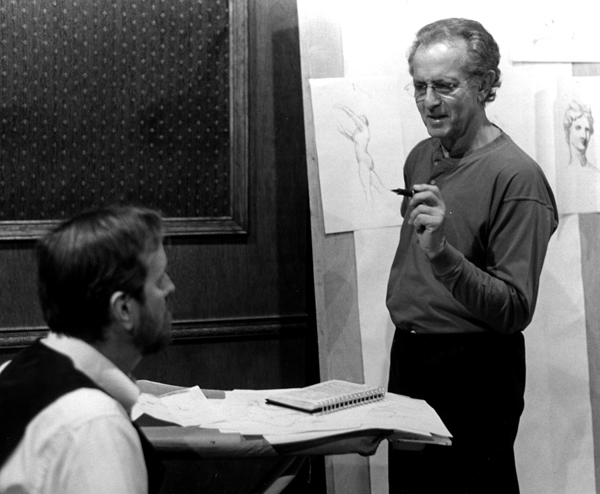 Director Mark Medoff rehearsing actor and playwright Bob Diven. Mark Medoff (Director) received a Tony Award for Children of a Lesser God. He was nominated for an Academy Award for the film script of Children of a Lesser God and for a Cable Ace Award for his HBO Premiere movie, Apology. He received an OBIE Award for When You Comin Back, Red Ryder. Among his movie credits are Claras Heart, Off Beat, and City of Joy. His only novel, Dreams of Long Lasting, was published in 1992. In 2000, Mark produced and directed the documentary film, Who Fly on Angels Wings, about a mobile pediatric unit travelling through the underserved areas of southern New Mexico. In 2001, Mark directed the feature film, Children on their Birthdays, based on the story by Truman Capote. His most recent play, Prymate, recently ran on Broadway. He is currently Artistic Director for the Creative Media Institute for Film & Digital Arts at New Mexico State University. He has been married for thirty-two years to Stephanie Medoff. They have three daughters and four grandchildren. Bob Diven (Playwright, performer) has been a professional artist for 25 years. He is an award-winning painter and internationally published illustrator, working as art director and designer in television, publishing, advertising, film, and stage. As an actor he has had many leading roles in plays and musicals with just about every theater and opera company in his home of Las Cruces, New Mexico, where he has been voted Best Actor, Best Songwriter, and Local Hero by newspaper readers polls. He was recently given the Community Arts Award for his contribution to the arts in his community by the Do�a Ana Arts Council. He is also a sculptor, musician and pilot. He has a self-released live-concert recording CD of his original songs:Play with Yourself: Live at the Black Box, and is a founding member, along with Steve Smith and Bob Hull, of Ballyheigue, an Irish music quartet. He was first directed by Mark Medoff in Do�a Ana Lyric Operas production of The Sound of Music, and later created the sets and artwork for the premiere of Marks opera, Sara McKinnon.